This project was inspired by a conversation with Alan Ross and a subsequent email from him with results of a similar test that he had run. Bottom line: essentially identical results, although presented differently here. Gray card placed on Zone V; Canon 5D MkII, 100mm f/2.8L IS macro lens; spot meter mode, manual exposure 1/50 sec. f/11 ISO 400; shaded daylight, auto color balance. This is the original RAW image saved to PSD and exported to JPEG with no adjustments in either Lightroom or Photoshop. 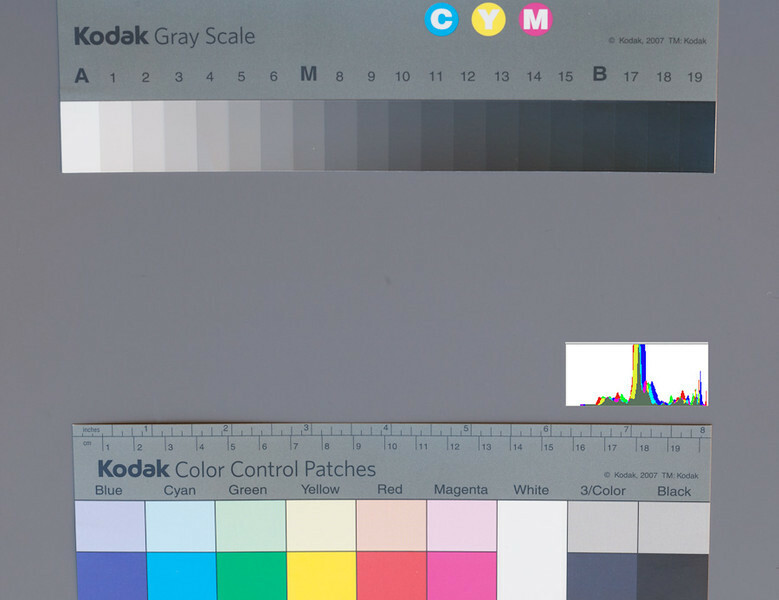 The slight blue cast, evident in the inset Photoshop histogram, is partially due to the gray card itself and partially due to the illumination. The midpoint of RGB values for the gray card is exactly where it ought to be for Zone V, which is nice confirmation of the camera's meter accuracy. The small patches of black were recorded too high (seen both visually and in the histogram), but this will not be a problem for the processed image (see #3). Here are the remaining six exposures, again with no adjustments or color correction to the images. Aperture was held constant at f/11; shutter speed varied in one-stop increments. Notice that the variation between exposures is not linear, which I wouldn't expect it to be. (Digital sensors are more responsive to higher light levels.) Alan found that Zone VII-1/2 was the highest placement that would retain highlight detail; that's confirmed here, where the Zone VIII exposure is just plain blown out. At the low end, though, there is still a bit of room between the Zone II exposure and absolute black (much more visible on the original, and in a print, than it is here). The exact gray-scale value for each exposure is given in image #4 of this series. 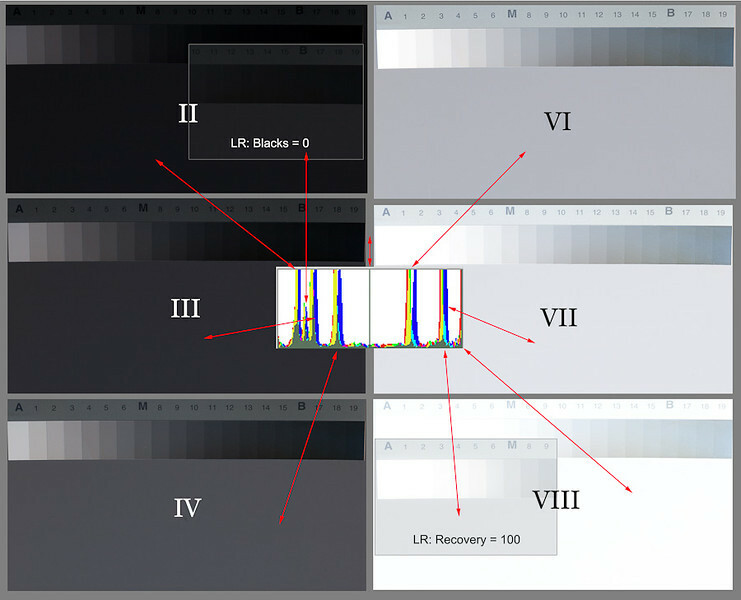 I also wanted to quantify what Lightroom adjustments could do to "rescue" the highest and lowest exposures. As shown in the insets, the Black slider, moved from its default value of 5 to 0, lightened the gray card to about Zone II-1/2; the Recovery slider, moved from its default of 0 all the way to the right, lowered the gray card essentially one full stop, with some useful extra detail showing in the gray scale. Again, this is with RAW files; I wouldn't expect JPEGs to be as forgiving. My take-away from this: exposure for digital shooting really is similar to transparency film, as I've read many times. Even knowing that I've got a little bit of leeway at the top, I'll definitely keep important highlights within the range that Alan recommended. Zone V exposure (same file as image #1), color- and contrast-corrected with a single curves layer in Photoshop. Insets show the revised histogram and the adjustments made to the curves. The reduced contrast below Zone V, observed in image #1, is simply no problem in the end result. Same file as image #3, different overlay—showing the actual values read from each exposure in image #2. 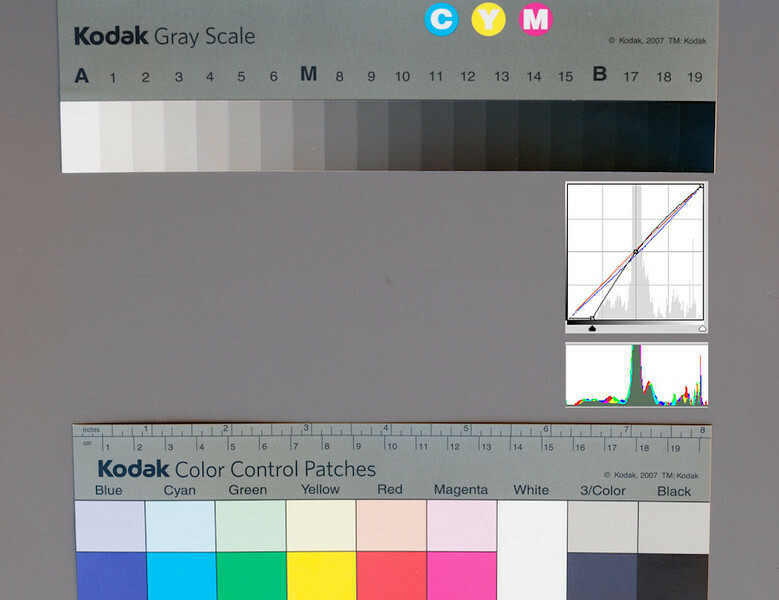 Percent values shown are an average of gray card R, G, and B readings from the Lightroom Develop module (scale of 0–100%); each gray patch is painted in with that scale converted to 0–255 for Photoshop (e.g., Zone V is 128, 128, 128 or #808080 for the Web). 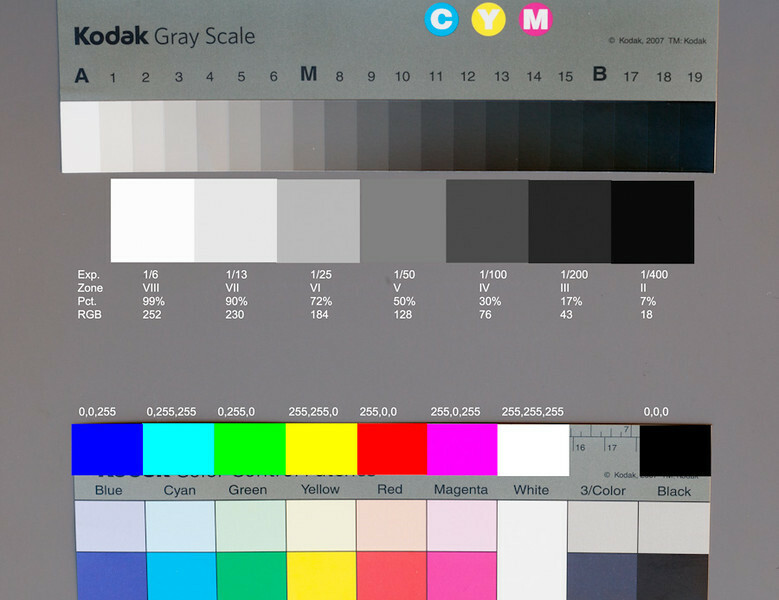 For comparison with the Kodak color card, RGB versions of the primaries are also painted in. They should look different, as they do—card samples are photographed from a CMYK print!